A healthcare assistant at Didcot Community Hospital is one of the special guests attending the wedding of Prince Harry and Meghan Markle. Courtney Hughes has previously been awarded the British Citizen Award by Theresa May for her contributions to the community, as she started a Christmas ‘Secret Santa’ charity collection when she was just 13-years-old after her great-grandmother had to spend Christmas in hospital. In the seven years since its creation, the charity has raised over £100,000 worth of donations that are distributed to children and older adults in hospitals and care facilities throughout the county. Courtney’s charitable efforts will be celebrated again on 19 May, when she will be amongst the 1200 special guests at the Royal Wedding in Windsor Castle; a fact that the 20-year-old still finds surprising. “I was with my mum when I got the letter and I was just in shock. I asked ‘Is this real?’ I thought someone was pranking me. With the event scheduled to take place in two weeks’ time, Courtney is now focussed on getting ready to enjoy the big day with her mum, who will be her guest at the wedding. 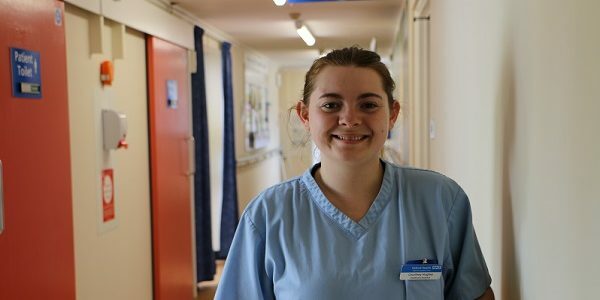 In addition to running her Secret Santa initiative year-round, Courtney also works full time as a healthcare assistant at Didcot Community Hospital. “Spending time with the patients is my favourite thing,” she said. Find out more about the work that our healthcare assistants do.